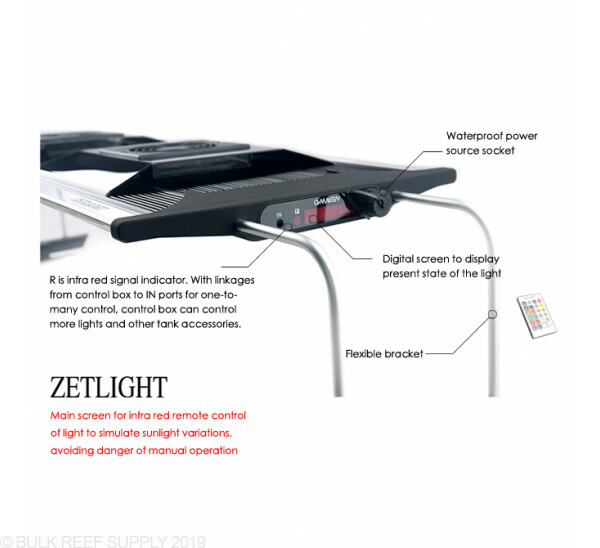 Recommended spread up to 40" x 20"
We have really grown to like the Zetlight QMaven series of lights for their low cost, and high quality components. With top of the line Bridgelux LEDs that have been placed throughout the fixture and the dense 40w LED groupings that simulate the intensity of natural sunlight. 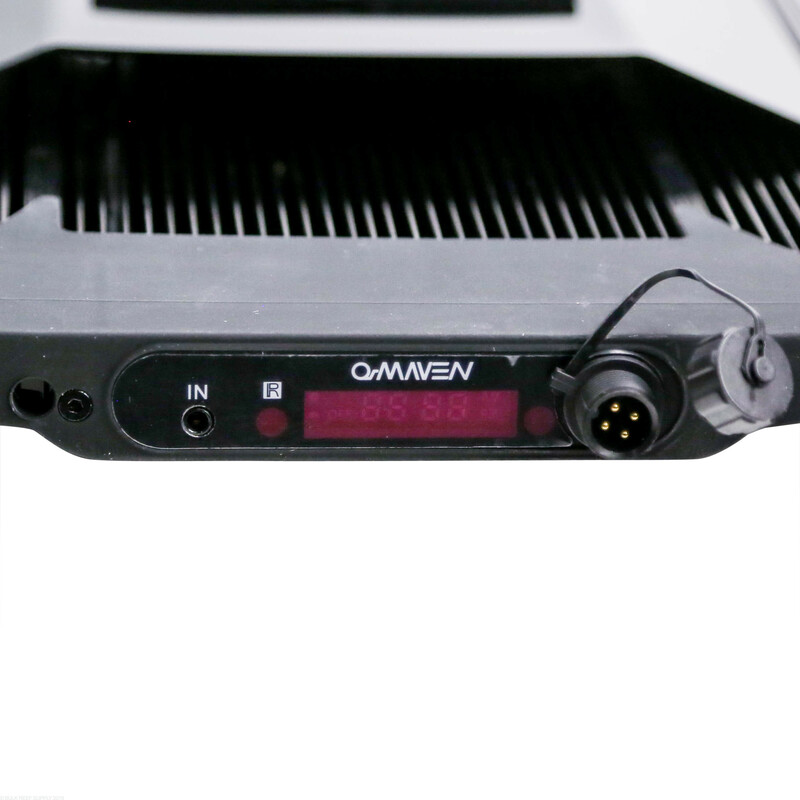 The QMaven lights are made of aluminum housing that promotes heat transfer while keeping a thin and lightweight fixture. 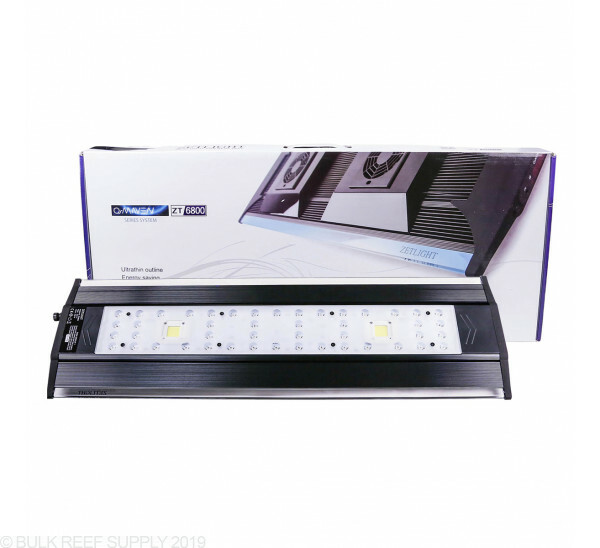 The moonlight strips are built right into the edges of the fixture giving it a very modern look while emitting a beautiful blue accent light. 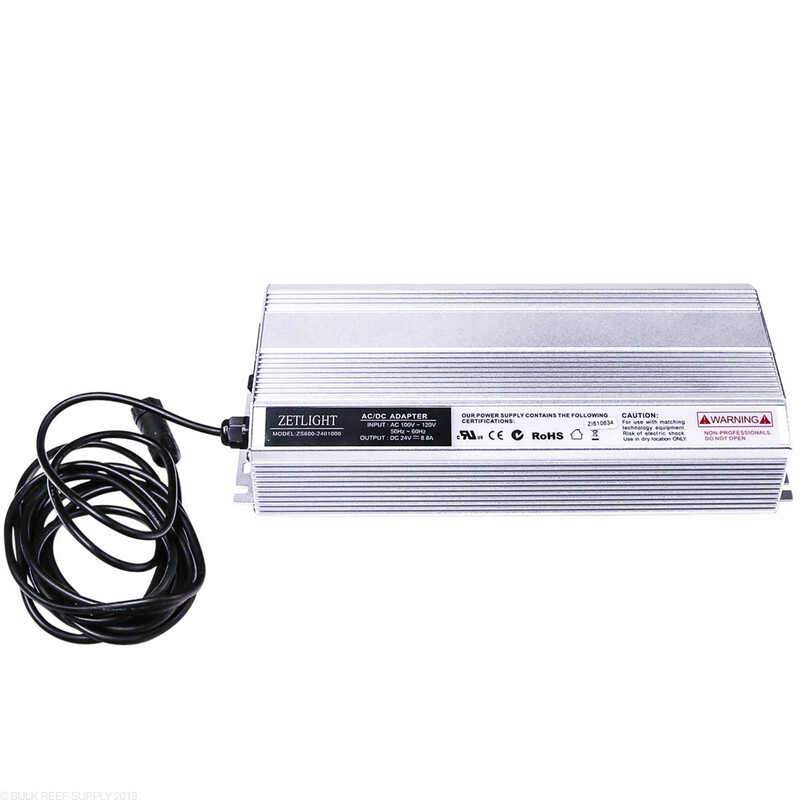 LED lights have a very specific temperature they like to run at for maximum efficiency and lifespan. 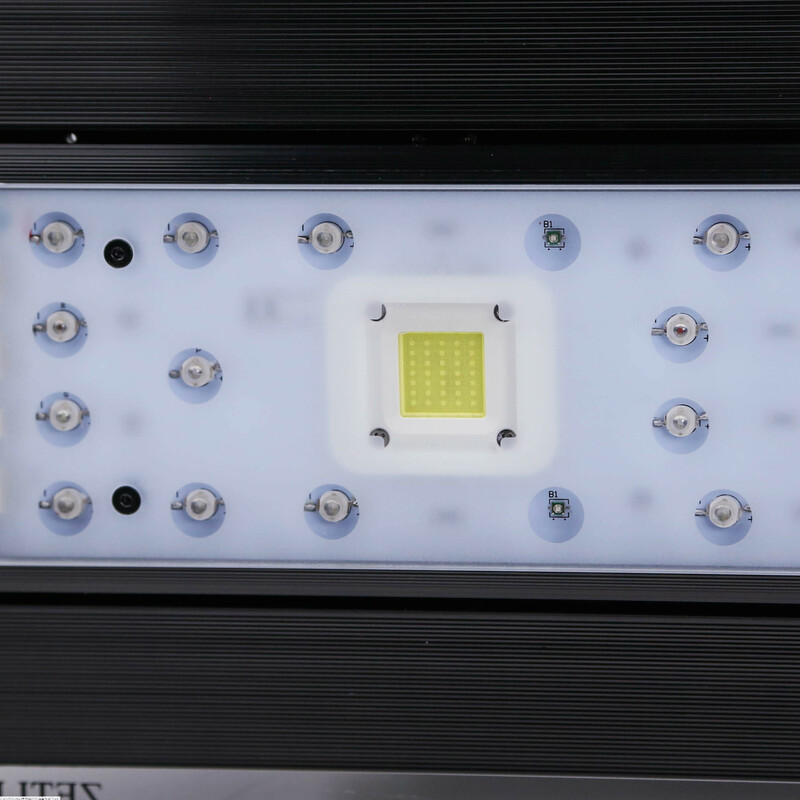 The ZT-6800 has a temperature display to let you know exactly how warm your fixture is running. 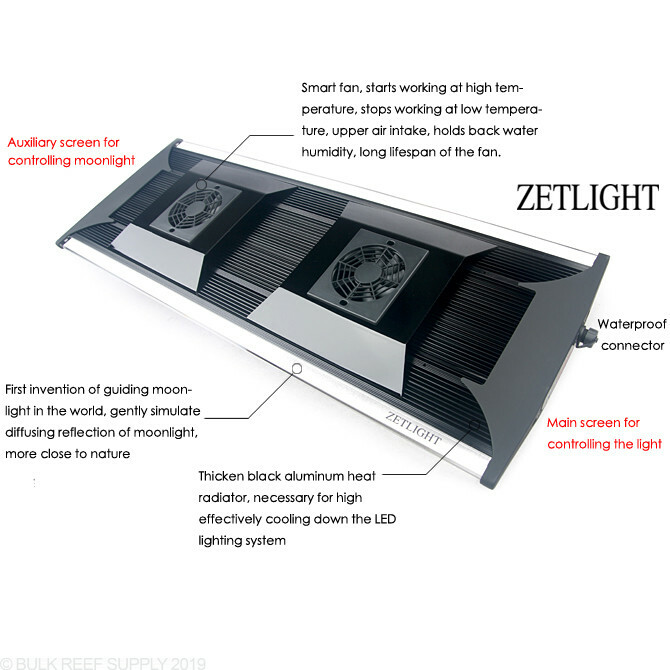 The fans built into the fixture will automatically turn on and adjust their speed to help remove any excess heat. 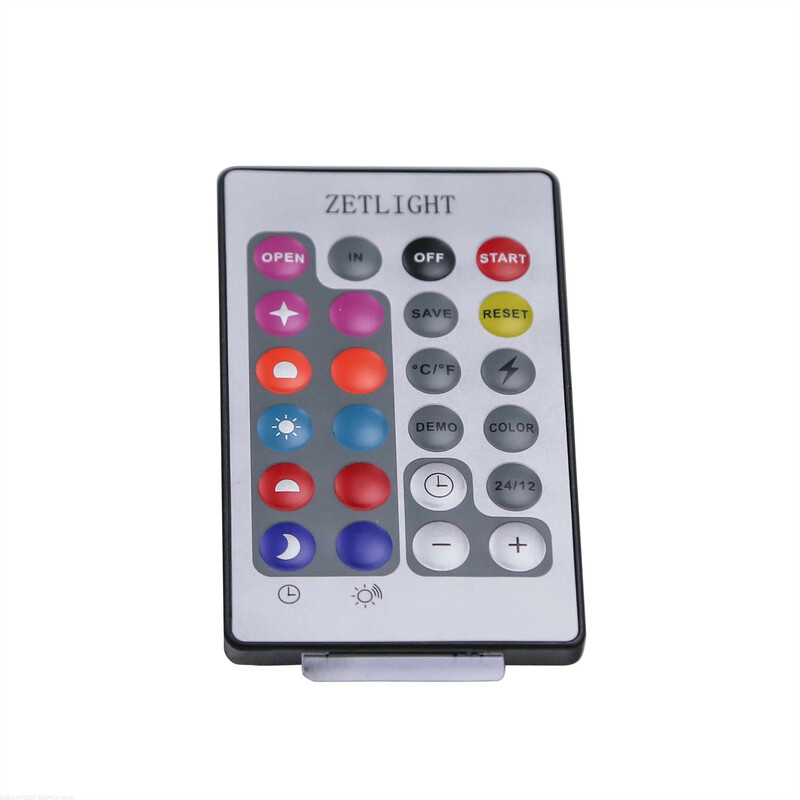 Control your Zetlight ZT-6800A with your Neptune Apex Controller, or the included onboard controller and remote control. With up and over 99 different settings selecting the right color and intensity will never be a problem. Included are easy to install mounting legs that can easily mount onto the rim of any glass or acrylic tank up to 1.2" thick. The legs can extend to fit aquariums as long as 47" and tuck in as tight as 28.3". 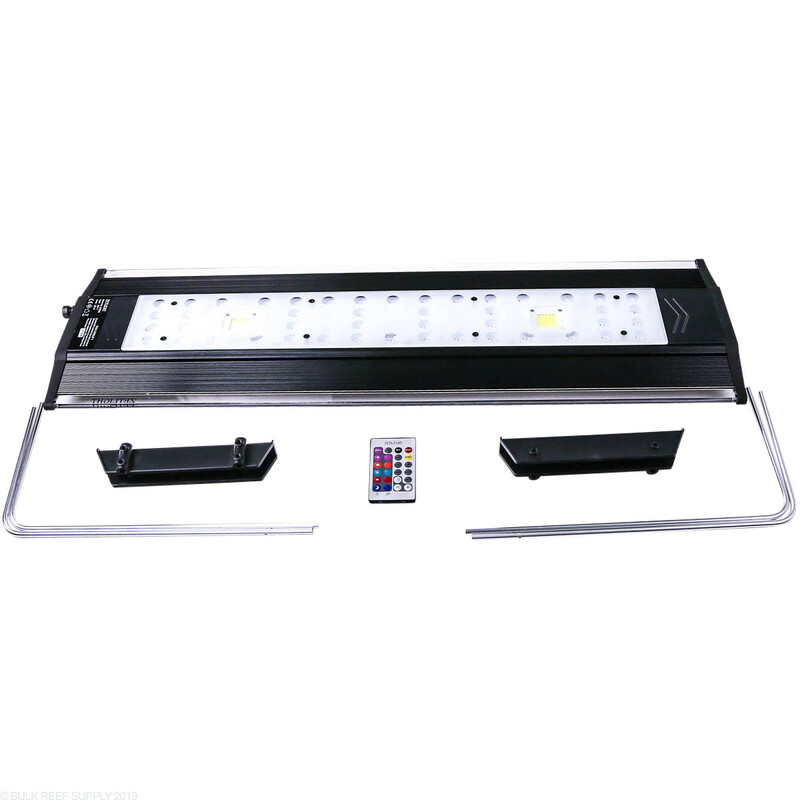 A hanging kit can also be used to suspend the fixture from ceilings, wall brackets or inside of a hood. 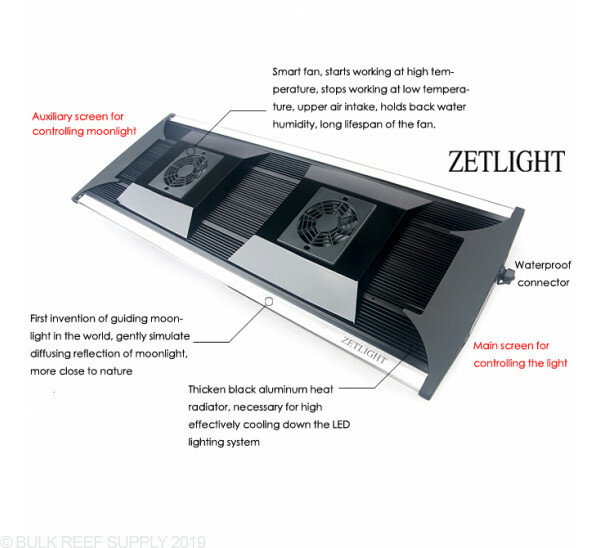 If you are going to mount the light within a canopy, we do recommend keeping a few inches between the fan and the top of the canopy to allow proper airflow around the fixture. 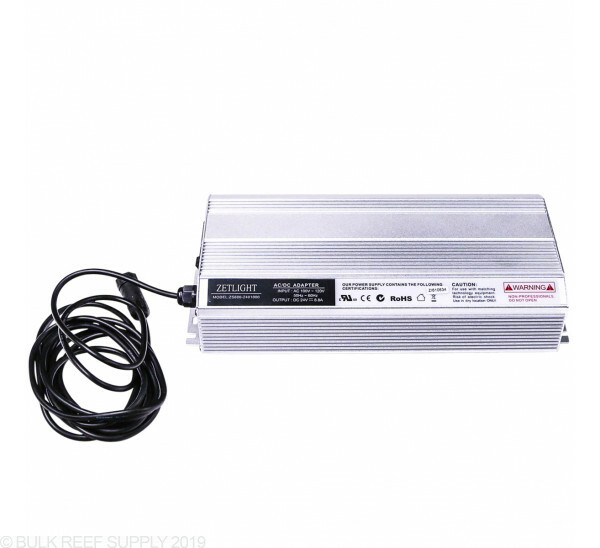 Max Spread - 48" x 24"
Recommended Spread - 40" x 20"
Tank Thickness: up to 1.2"
I bought my zetlight 6800 for my new 125 gallon reef tank because it is such a long tank (6ft) I needed a big light to fill the middle gaps. High end LED lights are soo expensive and in my opinion you get twice to three times the light for the price of one top of the line LED (radion). 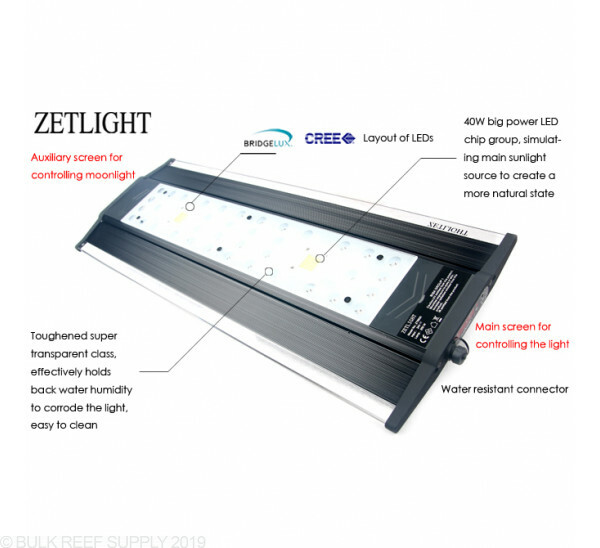 I believe it is a great deal especially if your looking for a longer light to light up a whole aquarium. 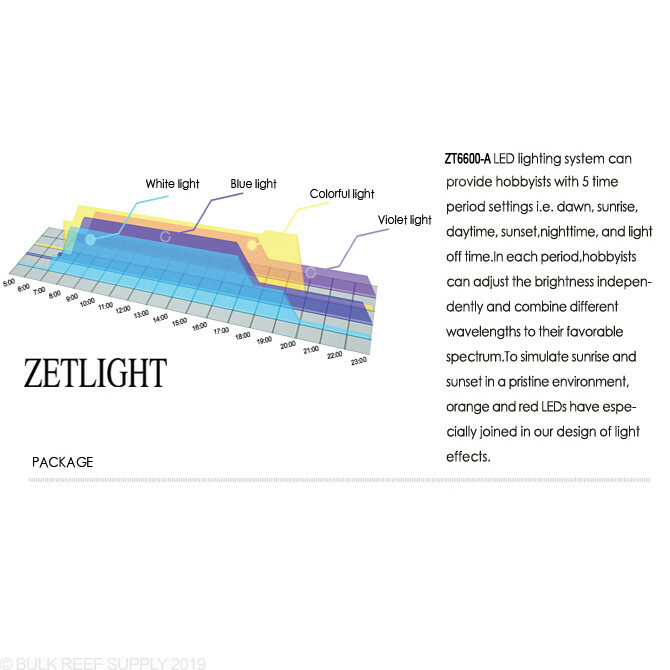 Zetlight might not be the first company that comes to mind when buying a high end LED but I believe they rival the best. The effect on the water in my opinion rivals my kessils as far as shimmer effect and color, it is excellent. You have so many options for colors and can program each color separately to create a perfect spectrum, it will also ramp up and down throughout the day. It looks very cool as well and is made almost completely of aluminum. It is easy to program but I highly recommend buying the a100 wifi controller because it makes it a lot easier and you can use your phone instead of the remote. My corals look great under it and they seem to be doing great under the light; it is a very powerful light. The fans are also quiet. The power box is pretty big but can easily be mounted in the stand somewhere. I don't think its that loud compared to some of my pumps either. I also love the blue accent lighting that lights up the acrylic trim on both sides. Overall I rave about this light and Highly recommend it. 5 stars all the way. This light is great. Beautiful outside and cool border light of blue. Easily programmed. Gives bright, shimmering light. 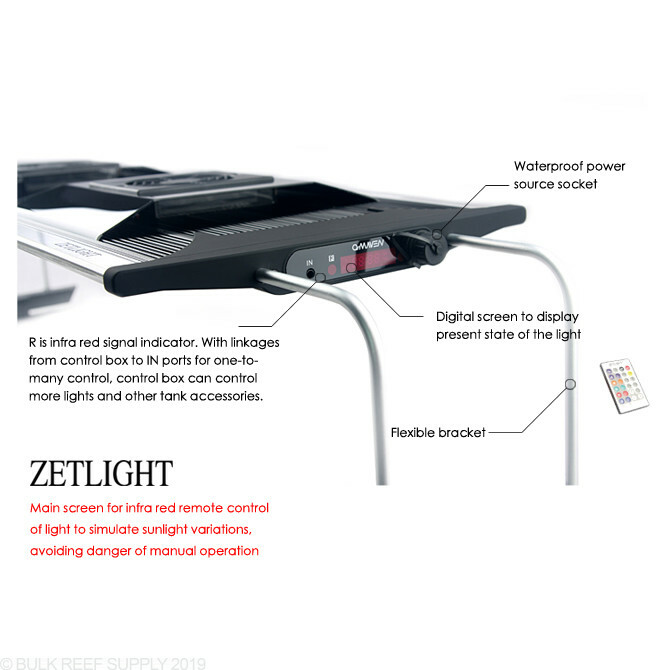 Needed an extra part from Zetlight and they were very helpful and repsonsive. Very happy! 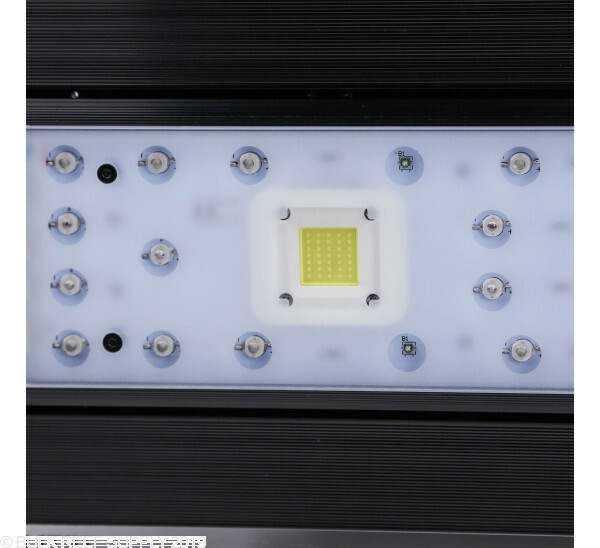 Like the previous reviewer this is my first LED light. 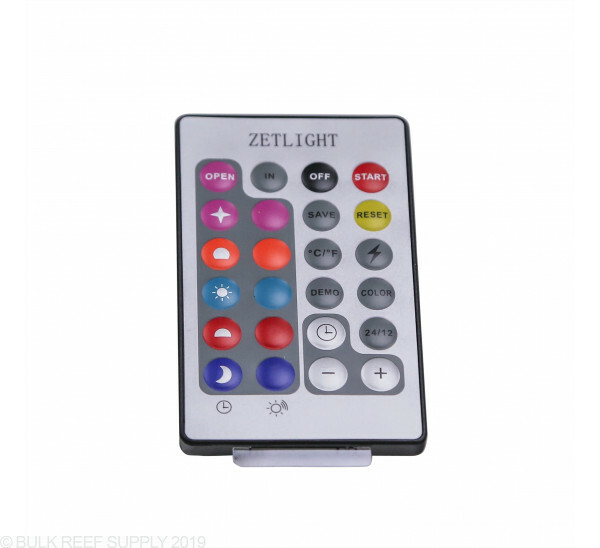 Unlike some of the other options this light is adjusted by changing the intensity of all the blues at once or all the 'color' lights at once or the two white light clusters at once or the violet lights all at once. I guess what I am saying is - one drawback is you don't get to set spectrum and then use one toggle to raise intensity. But, since I also bought the seneye, I have had no trouble setting up this light. I'm very happy with the way it looks but also with the light it produces. I was able to produce a very nice mid day bluish white peak that produces excellent shimmer with absolutely no disco ball color separation effect. I see no color separation at all with this light as I have it setup. Since I have only had it a month I can't speak to how it grow corals. But I can say I was able to get a very satisfying white/blue color with a PUR of around 70-75% and the PAR values of 50-300 I was looking for. Last thing I will say is the Power supply is in fact big and it will make a little noise. 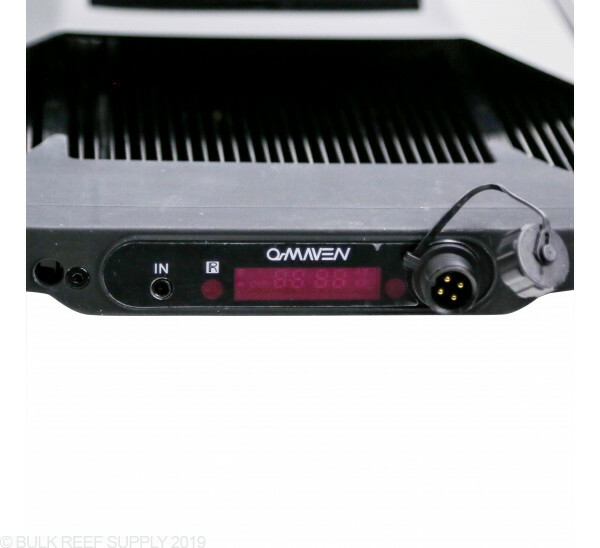 But my reef octopus dc return pump is louder. 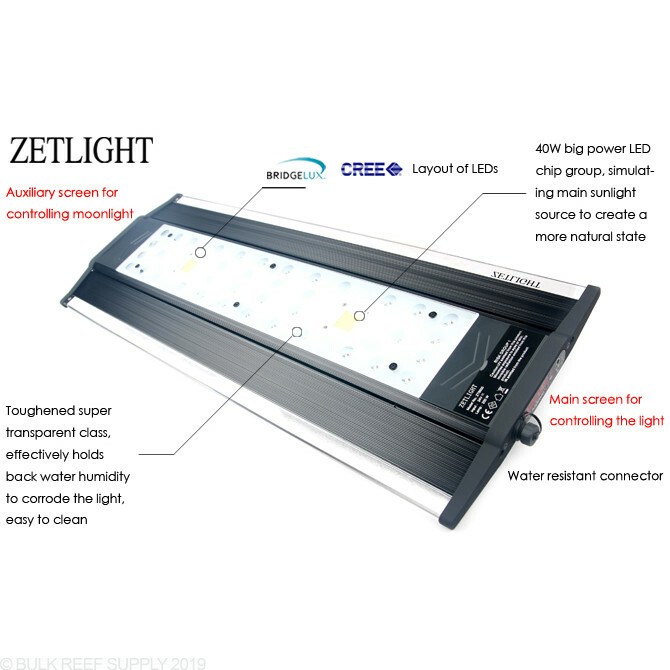 I just got the Zetligjt 6800 A and really like the product. This is my first LED so i was not sure what to expect. Asthetically, the light looks great over the tank. It is thin, and has an interesting blue light band in the front which can be turned on or off. The cooling fans are extremely quiet. It came with multiple mounting options as well. The lights are bright and it is easy to change the colors. I do not have the wifi add-on but do not think it is necessary. The only negative is the the power supply is big and has a slight hum to it, but it is not too noticible. I am looking forward to seeing how the corals react. 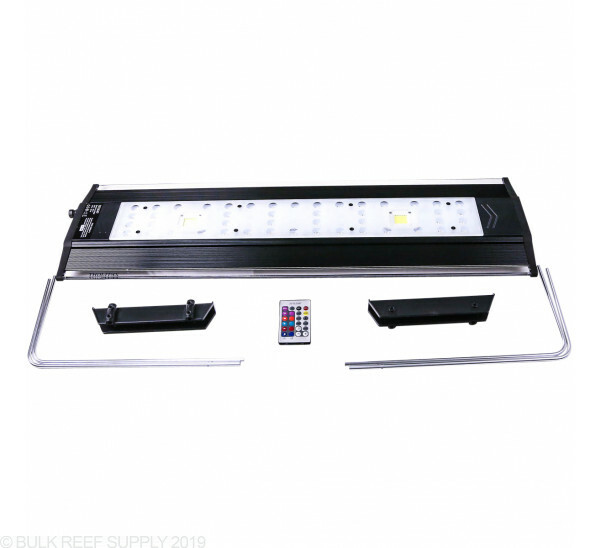 These fixtures are not set up to run in a master-slave configuration, and currently require separate control.